In the first quarter of 2018, 11 bit studios S.A. fully focused on preparations for the launch of Frostpunk, which came out on April 24th 2018. 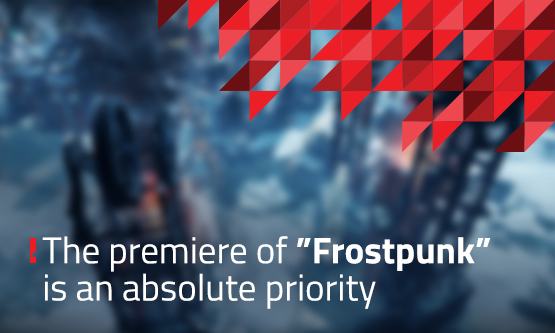 “We knew that Frostpunk, intended as a new milestone in the Company’s growth, had met our expectations in the first hours after launch,” comments Grzegorz Miechowski, President of the Management Board of 11 bit studios S.A. In just 15 minutes after release, the game topped the global best-seller list on Steam, the world’s largest digital games distribution platform. Within 66 hours of the release, fans purchased more than 250,000 copies of Frostpunk, which more than covered its production costs. Miechowski notes two more games made by third-party developers and published by 11 bit publishing are scheduled to launch this year. The first one is Moonlighter, coming out on May 29th 2018, and the other is Children of Morta, to be released in the second half of the year. The Company is also continuing work on a game under the working title Project 8. The game is now in the advanced prototype stage. 11 bit studios S.A. is also testing ideas for new products. “This task falls within the remit of our internal R&D division launched a few months ago,” says Miechowski. In the first three months of 2018, the Company earned revenue of PLN 2.24m and reported a net loss of PLN 0.98m. “Both figures were below the 2017 levels mainly as we cut back on our efforts to keep monetising This War of Mine and fully focused on preparations for the Frostpunk release instead,” Miechowski adds. He further points out that the release and related expenditure did not result in higher operating expenses. In the first quarter of 2018, operating expenses were just under PLN 3.19m, compared with PLN 2.56m a year earlier. “The change was not attributable to our day-to-day operations but to a donation of PLN 0.65m contributed to the War Child foundation, which supports child victims of war,” explains the CEO. 11 bit studios S.A. has supported the War Child foundation for several years now by donating a portion of its revenue from sales of This War of Mine. Miechowski underscores the net loss incurred in the first quarter of 2018 had no impact on the financial standing of 11 bit studios S.A. As at the end of March, the Company held over PLN 29.2m in cash. According to the Company’s CEO, the successful release of Frostpunk, the related business efforts, the upcoming launches of Moonlighter and Children of Morta and the expected continued solid sales of TWoM provide reasons to believe that the coming quarters will deliver much better financial performance. “As a result, the full year 2018 will be record-breaking for 11-bit studio,” concludes the CEO.